Mikhail Botvinnik was the sixth World Chess Champion and held his title for close to 15 years. Known as the father of the Soviet Chess School, Botvinnik’s former students included World Champions Anatoly Karpov, Garry Kasparov and Vladimir Kramnik among many other great players. Known as one of the most methodical players in history regarding his approach and preparation before matches, Botvinnik was a true “student of the game” until the very end. He is considered by many to be the most influential chess coach / trainer in history. Botvinnik was a Russian chess Grandmaster and three-time World Champion. He started to play chess at the age of 12 and became a National Master at the age of 16. 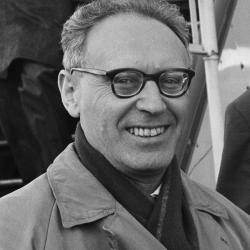 Later, Botvinnik held the World Champion title (with two brief breaks) from 1948-1963. Within that span of years, he lost two World Championship matches but was able to use the “rematch rule” to play his opponent again and take the World Championship title back. By the time he lost the title for the third time, FIDE had changed the rule and no longer allowed an immediate rematch. Botvinnik’s playing style was very strong and well-rounded with a focus on strategic play. Botvinnik was also one of the first players to prepare for his opponent’s ahead of time and also advocated mental and physical preparation before games. Botvinnik passed away on May 5, 1995.